“Sally is a little shy, so I’ll be doing most of the talking. We appreciate you giving us this opportunity to speak to you. 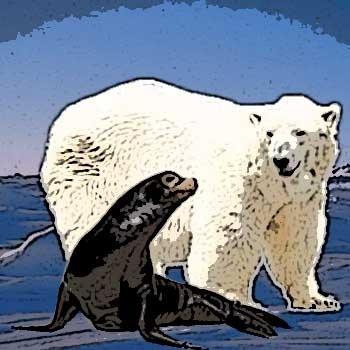 We also realize it must be odd to see a polar bear and seal standing side-by-side as friends, but times are changing here at the North Pole; we were forced to put our differences aside and join forces. We desperately need your help! I am sure you’ve heard about how global warming will affect our planet in the future, but let us assure you that global warming is causing major shifts on our ecosystem today. Ice is melting up here at an unusual and unprecedented rate. Our food supply is steadily on the decline. We’re losing friends and family members because of these shifts. This isn’t just a problem we face down the road. The Earth’s temperature is steadily on the rise my friends, and we all need to be concerned about what this means for our planet. We’re not pointing fingers, but something has to be done to reduce the greenhouse-gas emissions induced by humans. We’re asking for your help to stop these emissions before the damage becomes too great. Please remember how precious our Earth is, and join us in this most noble cause. I am hoping the US FISH and WILDLIFE SERVICE will start feeding the polar bears this fall, if they don't start soon many bears aren't going to make it through the winter because they are far too skinny already.